Create a mobile app for your next conference. Customize and instantly publish apps in minutes with no design skills or coding required. "Easy and affordable mobile event app builder"
We have used Yapp for several years now. As a small nonprofit that runs conferences with <300 attendees, we wanted something affordable that we could build and maintain ourselves, and we found exactly that with Yapp. It's very easy to go on the Yapp website, log in to my account, select the type of page I want to add the app and start uploading or pasting my content. Our conference attendees can then use the app to communicate with staff and other members and rate and comment on conference sessions. And we can post real-time alerts and updates. There's not much that I don't like about Yapp. They have improved the UI and added a number of features like multi-track scheduling in recent years that translate to a better looking app on our end. You can take the app for a test run by signing up for a trial account (14-day trial as of this writing). It takes no coding experience to build and manage the app. We need an affordable event app that we could build in-house. Most of the event app builders on the market cost several thousand dollars to build and employ, but for less than $500 (as of this writing), you can build a fairly simple, good-looking app in Yapp. We event had conference attendees tell us that they started using app for their own events after using ours for the conferences. "Best tool to manage events in an organization"
I like Yapp because it helps me in keeping a track of any event’s time, address and any other related information handy. It shows all the meetings, activities, workshops and more from a single centralized location. Also I can easily manage who will be able to the event details like schedule and place and also invite others for the events. If there is any change in the event or any new updates, Yapp can easily send that to all the attendees to make sure that they are aware of the changes. It helps in storing Word docs and PDF files for easy reference and sharing. Users can easily see them in the Yapp mobile app, as well as email it to their personal id. The only drawback I can see in Yapp is with the photo uploads feature. It is providing 3 different areas for the photo upload, but most of the users need just 1. So, they can remove the Crowd photos area as it does not allow captions in it. It offers various styling themes to choose from and thus makes your app more intuitive. The main benefit of using Yapp is that it allows me to create my own unique URL for the mobile app and share it with other users for easily remembering the URL. This makes it easy to download it on Android and iOS smartphones with just a single click. Also it has Twitter hashtags which can be used used for the event. Multiple twitter pages can be added to the app easily. Also it helps in cloning the existing apps by just making a few necessary edits and saves time for creating it from scratch. "Attendees were impressed by the app." It was easy to get started. The available features made me think about the design more than I originally planned and the app turned out better for it. I liked being able to insert speaker bios with all the contact info at hand, so attendees could quickly tag speakers in their social media posts. I submitted a question through the ZenDesk help feature and never got a response. However, I submitted the same question through the chat feature and received a response quickly. I asked about the ability to link speaker bios and documents to specific events in the schedule. That feature is not available, but they are working on it. I checked out a few other apps before this one. None had all the feature I wanted, but Yapp had most of the features at the best price. The app allowed all of our content to be in one easily accessible place for all attendees. It also allowed me to change info and notify attendees on the fly when the schedule changed. Easy to admin. Love the upload ability since a lot of our schedule and similar info is already available - hated having to enter it all manually with the free version so we just reformatted a few things, did some copy/pasting and uploaded it. Most importantly, our members loved it. Our member survey after the event indicated it was one of the things they commented on most, and it was all positive. Even had some non-users say they wished they had used it. All this was a bit of a surprise to me, as our membership is a bit older than average and have not been "early adapters" of tech in the past. Some still don't use email! I ran it as a "soft opening" a year ago and didn't promote it. It worked well on the limited scale, so this year we got a sponsor, started promoting it early and quadrupled the number using it. Users can upload photos to three different areas. I would probably like to see this reduced to just one, which I guess I can do simply by eliminating some of them. For example "Crowd photos" doesn't allow captioning, so it's not as popular. The social feed is definitely better for everyone that way. News Feed probably should be restricted because I had some people using it like the social feed. Give it a try! Smaller events probably best suited, but it is more robust than even we used. Will expand to other features in the future. We're a non-profit so it's really just all about engaging members and the sponsor/vendors who attend. We don't have to convert any of it to sales (I know...lucky us) but we did get a positive response from our vendors, so there's that. "A awesome app product with exceptional customer service"
I've used Yapp for my nonprofit organization's annual conference every year since 2012, and I've continued to be impressed with the growth and ease of use of this product. Yapp makes creating a professional, sleek event app easy for even the most tech-challenged. There are growing pains with any tech product, and with Yapp, some desired features took longer to come to fruition than we would have liked. Still, it's a great product with a robust suite of features, and a little patience has gone a long way! I'm the solo producer of an annual event for 300+ guests on a nonprofit organization's limited conservative budget. Yapp makes an easy to use and reliable product that is within a reasonable price point and doesn't require a developer. It's a perfect solution for our needs! "Easiest to use and affordable!" Yapp software is very easy to use, it has all the features needed to create an event application. Honestly, there is nothing I disliked. All the required information to set up the application is readily available. Look no further. Yapp has the most amazing Support Team, it will make your experience even easier. I wanted an application to help me keep track of a 21 day event, that involves a lot of participation from involved people and Yapp offers just that and more. I was able to enter all the dates at once, with information for each day, support documentations for all participants, pictures, and they even offer a section, where people can share their thoughts and comments. "Easily Build Small Event Apps"
We began using Yapp for our conferences before the new pricing went into effect. Even with the new pricing model (~ $300 for a single app as of this writing), it is still one of the best and least expensive event apps on the market. It requires little technical savvy to build event apps in Yapp, little time (large amounts of data can be entered by Yapp staff for a fee), and our members have found it very easy to use. Some have even begun using the app themselves for their own events. Overall, we are very satisfied with Yapp. Because our event attendees are not always technologically-savvy, we find the two-step download process to be a little difficult to communicate to these users. It would be easier to have a single download process where users can install our app directly. Also, technical support is sometimes slow to respond. We use this app for roughly 300 attendees and it works great (the EVENT DETAILS section doesn't allow us to select anything greater than 100 attendees and less than 501). Creating an affordable, easy-to-use app for small event (<300 attendees) is very easy. It has forced us to think of more ways to incorporate the app into our events. 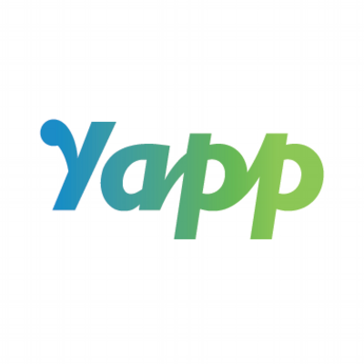 "Yapp is by far the best low cost solution we have come across to engage our attendees during events"
Yapp saves our organization about $1,500 to $7,500 per event app compared to other solutions. I could have justified the cost with efficiency gains for time and effort but when we found Yapp there was no reason to go with anyone else. I say this to anyone looking at event apps in the association management profession. Yapp is by far the best solution we have come across to engage our attendees during events and reducing our overall event printing and time cost. I could and would list all the great things about Yapp but your group just need to use Yapp. Production time, efficiency and material expenses. I liked the fact that I could design and create content and make changes direct without having to go through a third party. There are a number of different types of pages available that you can tailor make to suit what information you want communicated. Yapp provided great customer service when required. Nothing that comes to mind. Feedback from all attendees was great. If we could allow notifications for changes that need to be communicated and reduce them for the social feed it would be great. This is a great tool to have all information in a centralised place for large events. The platform to provide updates and new information to over 700 people was invaluable. This app is easy to use from the creator standpoint and the user standpoint. It is amazingly versatile! I would love if app users could comment on pictures! Contact them if you have any concerns. They have remarkable customer support! Having a highly functional seamless app for your clients that is also exceptionally easy for your staff to update is without question the most beneficial aspect! There are several things I like about Yapp - pricing, features and it's easy to use. This was my first experience implementing an app and it was easy to input information and user-friendly for our customers. I can't think of a feature I dislike. However, some of our older customers had trouble with the download and we had to help them through it. We used Yapp for our two conferences. We will continue to use it to reduce our printing costs and environmental impact. Yapp also produces timely content and updates to our customers. "Yapp was the perfect fit for the conference." The attendees loved it and it helped facilitate communications before, during, and after the event. We loved the fact that we could have a non-techie running the show and it just worked. We did not use the photo option as much as we imagined. Not sure why, but may have had more to do with the demographics. We are an engineering and consulting firm and we sponsor various events in some way. This was a great way to add value to a conference and increase communication options. The fact that you can publish right away and make any changes on your own. Not much to dislike about the app - it does everything i need it to do. Connecting my attendees together via the chats & photo uploads; getting messages out to all attendees; keeping everyone looped in to any last minute changes. "Yapp is a perfect, cost-effective solution for our small association! " Our small non-profit needed a cost-effective solution for meeting apps. We weren’t prepared, able or willing to spend thousands of dollars to build a custom app so Yapp was a perfect solution. It was very cost-effective and very easy to setup and customize. We love having a customized meeting app for a reasonable price! I am involved in several organizations with other association executives and if they are talking about apps anywhere I go, I tell them about Yapp! More analytics would be helpful - but I hear they are coming soon! I like the ability to control the content imported into the app. There are still many features that are missing. When you create your own schedule it should be added to your calendar or at least alert the attendee as the time approaches. Also, a better Twitter integration is needed to allow attendees to tweet from the app. The attendees of our were very impressed with the app that we created. it fed them real-time updates which they were very fond of, but it also gave them the opportunity to view the event's program on the go. This was my organization's first attempt at a mobile app. Some pages are hard to update via mobile devices. We are able to reach a demographic of people we haven't been able to. * We monitor all Yapp reviews to prevent fraudulent reviews and keep review quality high. We do not post reviews by company employees or direct competitors. Validated reviews require the user to submit a screenshot of the product containing their user ID, in order to verify a user is an actual user of the product. Hi there! Are you looking to implement a solution like Yapp?